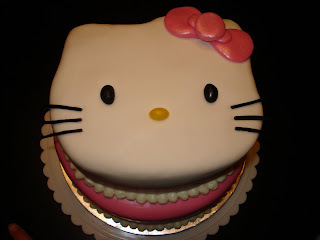 Hello Kitty has become quite the popular girls birthday cake! They are so much fun to make as well. This hello kitty cake consisted of two different chocolate cakes: dark chocolate fudge and chocolate devils food! Homemade cream cheese frosting was used in between layers as well as the crumb coating. The outside of the cake is marshmallow fondant cream cheese piping. 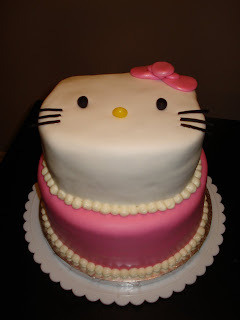 The hello kitty shape was cut out freehanded, because there is no such thing as a hello kitty cake pan.